Ronnie Burk’s poem Listen, whiteman! Before becoming a member of ACT UP San Francisco in 1996, Ronnie Burk lived on the island of Maui at several different periods in the early 1990s. Along with writing poetry and studying Buddhism, he became aware of the Hawaiian people’s struggle against racism and exploitation, something he himself experienced as a gay man of Mexican and Indigenous American descent. In Monica Sanchez‘s archive there are several letters he wrote to The Maui News on this topic. Here is one of a few examples of Ronnie including collage with the presentation of a poem. “Listen, whiteman!” speaks prophetically to the challenges the world faces in this day and age. It’s a happy coincidence the occasion of what would have been the 50th birthday of ACT UP San Francisco activist Michael Bellefountaine coincides with the ebook release of his book A Lavender Look at the Temple: A Gay Perspective of the Peoples Temple. Last year’s birthday post recalled Michael’s formative days as an AIDS activist by looking at his participation in ACT UP Maine during the Bush presidency of the early 1990s. During the last years of his life, Michael was enrolled in the history department at San Francisco State University. There he involved himself in a number of projects that included documenting the stories of those buried at Mission Dolores. For many years he had become interested in the Peoples Temple. Known mostly for the 1978 mass suicide of its members who had exiled themselves to the jungles of Guyana, Jim Jones and the Peoples Temple had been an undeniable influence on the progressive agenda that defined San Francisco politics of the 1970s from George Moscone to Willie Brown. As Michael began to research the Peoples Temple story beyond the horrific and histrionic headlines that dominated media representation, he was surprised to learn of an ongoing connection to Harvey Milk. Frustrated with the dismissive treatment of the subject by Randy Shilts in his biography The Mayor of Castro Street, which had Harvey describing Temple members as “weird” and “dangerous”, Michael decided to dig deeper into the story especially after he discovered an extensive involvement of gays and lesbians within the Peoples Temple. Michael’s intended to write a full length work but was unable to complete the book before his untimely death in 2007. Thanks to the tireless effort of his mother Dora, his book was self-published in 2011 in both paper and hardback editions. A Lavender Look at the Temple can now be purchased as an ebook at this link. The book also examines how gay, lesbian, bisexual and transgender Peoples Temple members faired in their community during a hostile time in history. 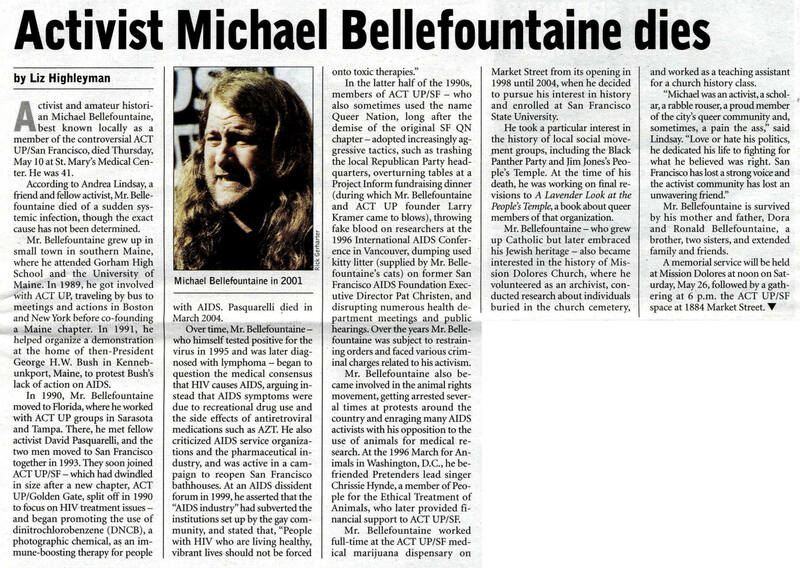 In the last years of his short life, the author, Michael Bellefontaine, was a staunch gay rights and AIDS activist in San Francisco, California but he was also part of the Peoples Temple and Jonestown history. While other writers have long dismissed Milk’s relationship with the Peoples Temple, Bellefontaine not only addresses it but attacks and analyzes the information from reliable sources regarding their association. First, you have to understand the lure of the Peoples Temple. It was welcoming of people from all walks of life including races, genders, ethnicities, sexual orientation, and religions. Rev. Jim Jones was charismatic and fooled people into believing that he had special powers to read minds and cure people. But it wasn’t just Jim Jones that lured it’s members. The People Temple offered services such as drug and alcohol rehablitation; a food pantry and soup kitchen; counseling; a school; elder care and day centers; and other facilities widely staffed and run by it’s members. The Peoples Temple welcomed people of all walks of life including the ostracized, the outcasts, criminals, etc. into their world. Michael’s talent as a writer comes not only from his thorough and thoughtful research but also his skill at relaying the personal experience of gay and lesbian Temple members through a gripping narrative. In fact, Michael’s research was included by San Francisco journalist David Talbot in Season of the Witch: Enchantment, Terror and Deliverance in the City of Love, Talbot’s book about the city during the 1970s and 1980s. While it’s unfortunate Michael wasn’t able to further develop his research on the Peoples Temple (not to mention the other areas he would have explored as a historian and researcher) we can remain grateful his mother Dora made sure that this brief but potent document is preserved and available. Happy 50th Birthday Michael Bellefountaine! ACT UP member Michael Bellefountaine participating in Critical Mass bike ride in San Francisco, circa 2002.